Order in the next 3 hours, 22 minutes an 45 seconds for same day shipping. The new stylish self inking stamp, featuring a new high quality brushed stainless steel finish, provides everyday use durability and a professional look. 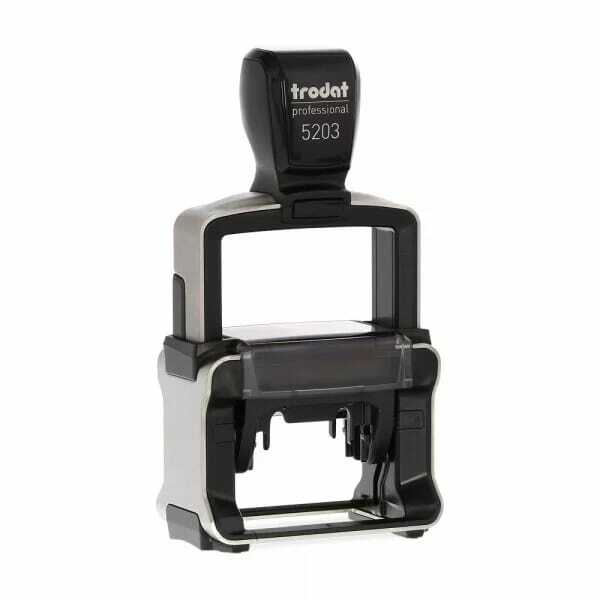 The new 5203 Professional 4.0 self inking stamp has an impression size of 49 x 28mm. Customise the stamp with your own impression that allows up to 6 lines of personalised text and your own logo. Along with an ergonomic handle, the stamp has cushioning elements to reduce vibrations for a better imprint. Perfect for printing your company address, contact details, illustrations with logo, advertising, accounting or warehouse documentation. The compatible replacement ink pad 6/53 is available in 5 standard colours: black, blue, red, green or violet. Manufactured using a high content of recycled plastic, the stamp is climate neutral for a better environment. Customer evaluation for "Trodat Professional 5203 49 x 28 mm - 6 lines"